Objective: To assess the effect of reduction or modification of dietary fat intake on total and cardiovascular mortality and cardiovascular morbidity. Data sources: Cochrane Library, Medline, Embase, CAB abstracts, SIGLE, CVRCT registry, and biographies were searched; trials known to experts were included. Included studies: Randomised controlled trials stating intention to reduce or modify fat or cholesterol intake in healthy adult participants over at least six months. Inclusion decisions, validity, and data extraction were duplicated. Meta-analysis (random effects methodology), meta-regression, and funnel plots were performed. Results: 27 studies (30 902 person years of observation) were included. Alteration of dietary fat intake had small effects on total mortality (rate ratio 0.98; 95% confidence interval 0.86 to 1.12). Cardiovascular mortality was reduced by 9% (0.91; 0.77 to 1.07) and cardiovascular events by 16% (0.84; 0.72 to 0.99), which was attenuated (0.86; 0.72 to 1.03) in a sensitivity analysis that excluded a trial using oily fish. Trials with at least two years' follow up provided stronger evidence of protection from cardiovascular events (0.76; 0.65 to 0.90). Conclusions: There is a small but potentially important reduction in cardiovascular risk with reduction or modification of dietary fat intake, seen particularly in trials of longer duration. Previous investigators have extrapolated the reduction in coronary heart disease that might be expected from changes in blood cholesterol concentration, 4 7 even though there is direct evidence from randomised controlled trials of the effect of modification or reduction of intake of dietary fats. We therefore performed a systematic review to assess the effect of change in dietary fat intake, which would be expected to result in a lowering of cholesterol concentration, on mortality and cardiovascular morbidity, using all available randomised clinical trials. The interventions included any of the following: reduction in intake of total fat; reduction in intake of saturated fat; reduction in intake of dietary cholesterol; or a shift from saturated to unsaturated fat. Much of the methodology has been reported previously.9 Briefly, we developed a search strategy to search for nutrition based randomised controlled trials on the Cochrane Library, Medline, Embase, CAB abstracts, CVRCT registry (inception of database to mid-1998), and SIGLE (January 1999). We searched bibliographies and contacted related Cochrane Review Groups and 60 experts (May 1999) for further trials. There were no language restrictions. The inclusion criteria were adequate randomisation; usual or control diet or placebo group; stated aim of intervention was reduction or modification of intake of dietary fat or cholesterol, unless the intervention was exclusively omega 3 fatty acids; intervention was not multifactorial; the intervention group were not children, acutely ill, or pregnant; the intervention (diet provided or supplementation) continued for at least six months or follow up (after dietary advice) was at least six months; and data on mortality or cardiovascular morbidity were available. Our primary outcomes of interest were effects of intervention on total mortality, cardiovascular mortality, combined cardiovascular events (including all available data on cardiovascular deaths, non-fatal myocardial infarction, stroke, angina, heart failure, peripheral vascular disease, angioplasty, and coronary artery bypass grafting), and quality of life. Event data were included only when they occurred during provision of diet or supplement (when these were provided) or while randomisation and blinding were maintained (in dietary advice trials). Inclusion was assessed independently by two assessors (LH, RLT) and differences were resolved by discussion, with, if necessary, a third reviewer (RAR). Data extracted independently in duplicate (by LH and RLT) included type of participants, interventions, and outcomes; characteristics of trial quality; numbers of events; total patient years in trial; and data on potential effect modifiers. Effect modifiers included participants' baseline risk of cardiovascular disease, trial duration, mode of intervention, change in intake of dietary fats, and serum cholesterol concentration achieved. Criteria for assessment of trial quality included method of randomisation, physician blinding, participant blinding, and any systematic difference in care between the intervention groups. We used meta-analysis to explore the primary hypothesis, which was that reduction or modification of dietary fat intake affects mortality, cardiovascular mortality, and cardiovascular events. We examined the effects of duration of intervention, initial level of cardiovascular risk and dietary fat intake, type of intervention, and changes in intake of total, saturated, monounsaturated, and polyunsaturated fats and blood cholesterol concentration using subgrouping of trials and meta-regression. We excluded trials that aimed to alter omega 3 intake as the method of action (if any) is probably different from any action caused by the reduction in intake of total or saturated fat—that is, it does not primarily lower low density lipoprotein cholesterol. The pooled rate ratio for total mortality was 0.98 (95% confidence interval 0.86 to 1.12), which indicates little, if any, effect (fig 2). The data on cardiovascular mortality indicate a slight (9%) protection from modification of intake of dietary fat (0.91; 0.77 to 1.07) (fig 3) and a 16% reduction in cardiovascular events (0.84; 0.72 to 0.99) (fig 4). A funnel plot of effect size versus sample size did not show any evidence of bias (data not shown). The Oslo diet-heart trial provided some oily fish (a source of omega 3 fatty acids) to participants in the intervention group.33 Exclusion of the results of this trial attenuated the rate ratios for all three main outcomes (total mortality 1.02 (0.91 to 1.14); cardiovascular mortality 0.94 (0.79 to 1.11); combined cardiovascular events 0.86 (0.72 to 1.03)). Figure 5 shows the results of the meta-analyses, subgroupings, and sensitivity analyses performed. Table 2 shows the results of the meta-regressions. We obtained results for specific length of time on diet, initial level of cardiovascular risk, or mode of intervention through subgrouping of trials. Trials in which the mean length of follow up exceeded two years showed somewhat larger reductions in combined cardiovascular events (0.76 (0.65 to 0.90) v 0.96 (0.75 to 1.23) than trials of less than two years' duration). 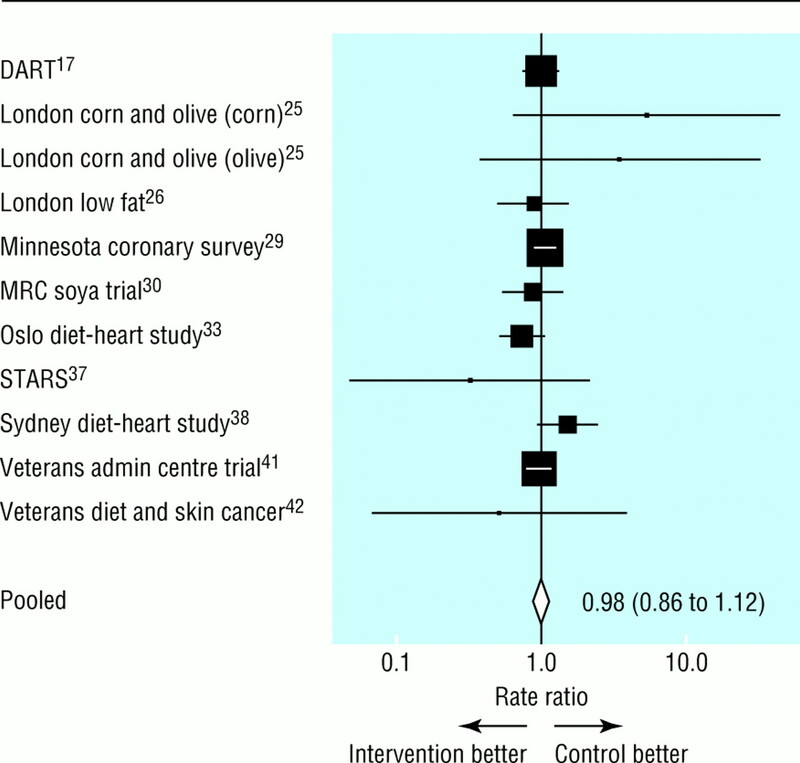 When we excluded data from the Oslo diet-heart study, the rate ratio for combined cardiovascular events for trials with mean follow up longer than two years was not altered (0.77; 0.62 to 0.96). Total mortality was not substantially influenced by mean follow up. The relation between mean follow up and cardiovascular events was further explored through meta-regression. The negative slope (ln (rate ratio) v mean follow up time, slope −0.096; −0.190 to −0.002) suggests fewer cardiovascular events at longer mean follow up times in the groups with reduced or modified fat intake. Trials with participants at high initial cardiovascular risk suggested very similar levels of protection from combined cardiovascular events (rate ratio 0.84; 0.70 to 0.99) as did trials with participants at low cardiovascular risk (0.82; 0.56 to 1.20). Neither the method of dietary modification (by diet advice, advice plus a supplement, or diet provided) nor the initial level of intake of dietary fat influenced rate ratios. We used meta-regression to explore the effects on total mortality and combined cardiovascular events of changing the proportion of energy from total fat and of altering serum cholesterol concentrations. Meta-regressions also explored the relation between change in proportion of saturated fat, polyunsaturated fat, and monounsaturated fat on cardiovascular events. These suggested that total mortality and cardiovascular events were reduced as energy from fat, and as serum cholesterol concentrations, fell. Similarly, cardiovascular events were reduced as each of the fat subfractions decreased. However, none of these relations were convincing (none of the slopes were different from zero at a P<0.05, see table 2), except for that of monounsaturated fat. Here the slope depended heavily on one medium sized trial, St Thomas's atherosclerosis regression study (STARS),37 and should therefore be treated with caution. Pooled results of dietary fat trials indicate that reduction or modification of intake of dietary fat reduces the incidence of combined cardiovascular events by 16% (rate ratio 0.84; 95% confidence interval 0.72 to 0.99) and cardiovascular deaths by 9% (0.91; 0.77 to 1.07). No effect was seen on total mortality. 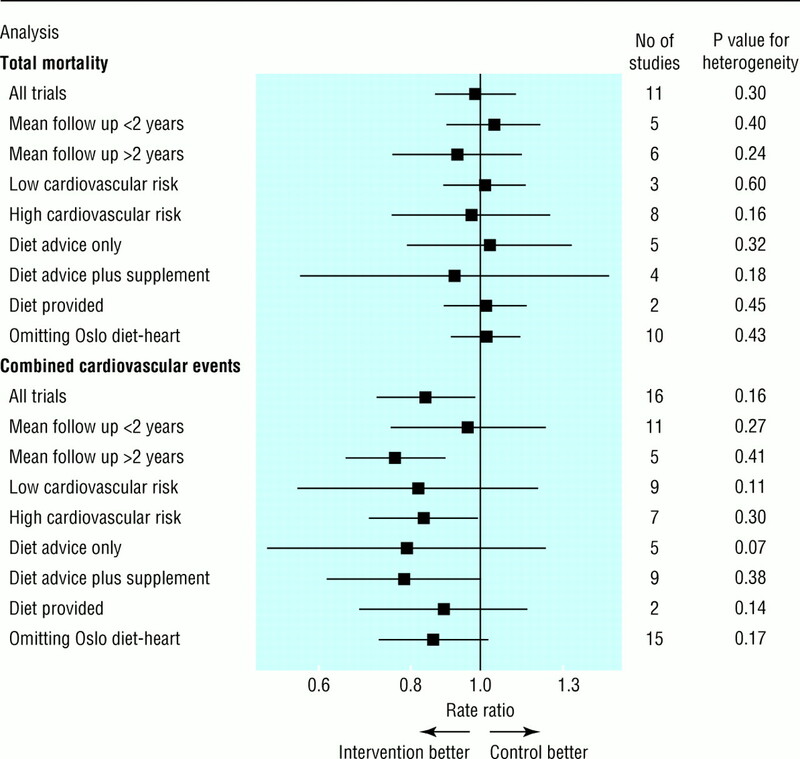 Exclusion of data from the Oslo diet study33 attenuated the effects on cardiovascular events. In this trial participants in the intervention group were supplied with oily fish, in addition to dietary advice. Oily fish, which is rich in omega 3 fatty acids, seems to have independent beneficial effects,44 so the benefits seen in this trial may have been due to the fish oils and not to cholesterol lowering or alterations in other dietary fats. Subgrouping by length of mean follow up suggests that virtually all protection from cardiovascular events occurs in trials of at least two years' duration. In trials with mean follow up of two years or less the reduction in events was only 4%, whereas in trials with longer follow up reductions of up to 24% were seen. This effect was confirmed in a meta-regression. The division at two years was chosen after we studied initial data from the Scandinavian simvastatin survival study (4S), which assessed the effect of simvastatin on mortality and morbidity after myocardial infarction.45 In that study little difference in event rates between treated and control groups emerged until after two years. The similar time lag between the effects of dietary intervention and statins suggests a common mechanism, perhaps through effects on the scale, type, and stability of atherosclerotic plaques (rather than rapid alteration in blood coagulability), but other mechanisms may also be operating. It is not clear whether it is the duration of the intervention or the duration of the follow up that determines whether the intervention is effective. Sustained change in dietary behaviour, promoted by long interventions, is probably necessary to achieve reduction in cardiovascular events, and lengthy follow up is probably required before pathophysiological changes that reduce clinical events are observed. Subgrouping suggested no effect of initial level of risk on outcomes. Both high and low risk groups had a similar level of risk reduction for combined cardiovascular events. This is in contrast to results of previous studies,46 though initial levels of risk in studies in this systematic review were generally high (people in control group at “low risk” of cardiovascular events suffered 2.57 events per 100 people per year and those at “high risk” 7.62 events per 100 people per year). Most of the events in this review occurred in men. Only two trials with events included women 29 42 so it may not be appropriate to generalise these results to women. Subgrouping by mode of intervention showed no benefit of providing the entire diet compared with dietary advice or advice and a supplement. This was surprising as we expected that provision of food would have a more powerful effect on events than dietary advice alone. Meta-regression provided weak evidence that a greater reduction in serum cholesterol concentrations in the intervention group compared with the control group resulted in a slightly greater reduction in cardiovascular events and mortality. A reduction of over 20% in total serum cholesterol concentration can result in a 25% fall in mortality from coronary heart disease.47 Within dietary trials in this review the mean initial serum cholesterol concentration was 5.8 mmol/l, with a fall of 0.64 mmol/l (11%). This degree of reduction is similar to that achieved by early fibrates, which show reductions in rates of coronary heart disease only among those at high risk.46 However, early fibrates seemed to increase mortality from other causes, and hence any benefit from this reduction in cholesterol concentration was outweighed by adverse effects of the drugs themselves. In dietary modification this degree of cholesterol lowering is probably of modest overall benefit. In this review we aimed to find trials that modified or reduced dietary fat intake for at least six months, even when mortality and morbidity were not reported. We tried to contact trial authors to ascertain whether it was known if any deaths or cardiovascular events had occurred. For this reason, many of the included trials are small but are included in the hope of augmenting the data from larger trials and reducing bias. Although small trials cannot individually hope to achieve useful data on rare events, in meta-analysis we are increasing the power of the group of studies by pooling. We included factorial trials (for example, the diet and reinfarction trial (DART)17) when it was possible to separate out the data on the effect of change in dietary fat from the other interventions (which are randomly distributed across the fat control and intervention groups). We excluded multiple risk factor intervention trials as it is not possible to disaggregate the effects of change in dietary fat intake from other, potentially effective interventions such as increasing exercise, stopping smoking, and change in other dietary constituents. There is already a systematic review on this topic.48 We excluded the Lyon heart study49 as inclusion in our review was decided by the stated intention of the trial.49 This trial nowhere states the intention to reduce or modify dietary fat intake and the major effect on diet was to increase the omega 3 fat intake. We excluded the Finnish mental hospital study50 as it was not a truly randomised design (a cluster randomised trial with only two clusters). Although we amassed 30 902 person years of observation, 1430 deaths, and 1216 cardiovascular events, considerable uncertainty exists over the size of effects and the means by which they were achieved given the scarcity of trials longer than two years' duration. It is unlikely that further resources will now be forthcoming to perform a large trial of dietary modification. Consequently the evidence pooled in this review contributes all that is available to guide clinical practice and health policy on dietary manipulation. However, publication of data on deaths or cardiovascular events in the large ongoing trials of dietary fat lowering with cancer end points would augment currently available data. In this review we have tried to separate out whether changes in individual fatty acid fractions are responsible for any benefits to health (using the technique of meta-regression). The answers are not definitive, the data being too sparse to be convincing. We are left with a suggestion that less total fat or less of any individual fatty acid fraction in the diet is beneficial. The findings on cardiovascular events are broadly in keeping with benefits that might be expected from modest lowering of cholesterol concentration and certainly provide support, at an individual level, for the central role of dietary fat intake in the causation of cardiovascular disease. This study was conducted as a Cochrane systematic review under the auspices of the Cochrane Heart Group, whose assistance is gratefully acknowledged. We thank Gill Clements for her comments throughout the review, all those at the Systematic Reviews Training Unit for their help and support, and all the trialists and experts who kindly provided information and advice. The original version of this review is available in the Cochrane Library (Hooper L, Summerbell CD, Higgins JPT, Thompson RL, Clements G, Capps N, et al. Reduced or modified dietary fat for prevention of cardiovascular disease. Cochrane Database Syst Rev 2000;(2):CD002137) but does not include some post-hoc analysis performed as a result of BMJ reviewer's comments. Contributors: All authors were actively involved in the design of the review and provision of critical revisions to the manuscript. JPTH performed the statistical analyses, RLT duplicated trial inclusion/exclusion and data extraction, and RAR arbitrated on study inclusion when necessary. SE and CDS were primary advisers. GDS provided epidemiological expertise and NEC provided a clinical perspective. LH originated and was primarily responsible for planning and carrying out the review, was the principal author, and is guarantor for the paper. Funding LH's work on this review was partly funded by a studentship from the Systematic Reviews Training Unit, Institute of Child Health, University of London, and Shropshire Health Authority, Shrewsbury, contributed to travel expenses. RAR is supported by the British Heart Foundation. .The effects of low fat low cholesterol diets on the serum lipids.Circulation1950; 2:475–476. .Dietary fat intake and the risk of coronary heart disease in women.N Engl J Med1997; 337:1491–1499. .Effects of the national cholesterol education program's step I and step II dietary intervention programs on cardiovascular disease risk factors: a meta-analysis.Am J Clin Nutr1999; 69:632–646. .Systematic review of dietary intervention trials to lower blood cholesterol in free-living subjects.BMJ1998; 316:1213–1220. 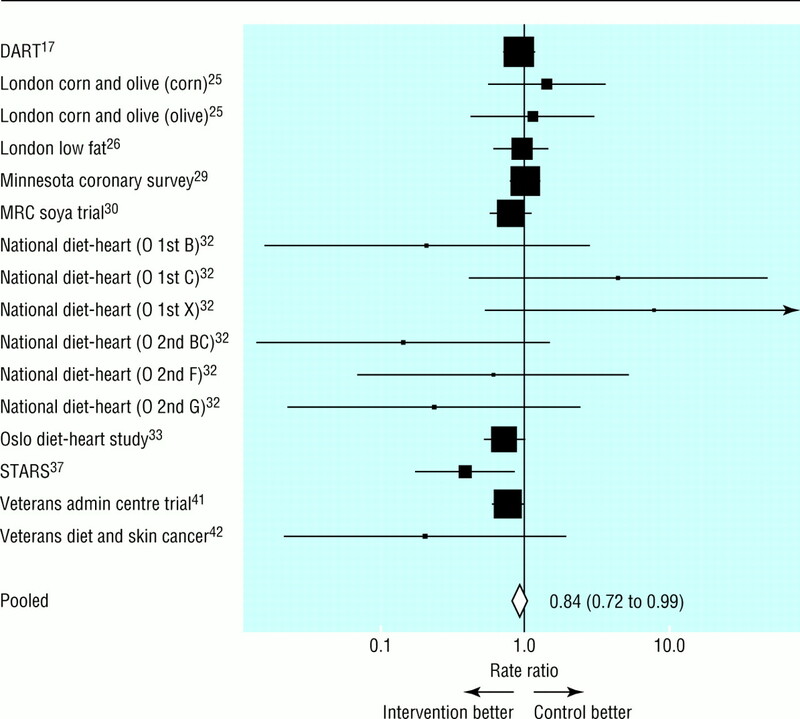 .Can dietary interventions change diet and cardiovascular risk factors? A meta-analysis of randomized controlled trials.Am J Public Health1997; 87:1415–1422. .Dietary lipids and blood cholesterol: quantitative meta-analysis of metabolic ward studies.BMJ1997; 314:112–117. .Effect of dietary fatty acids on serum lipids and lipoproteins. A meta-analysis of 27 trials.Arterioscler Thromb1992; 12:911–919. .Spurious precision? Meta-analysis of observational studies.BMJ1998; 316:140–144. .Reduced or modified dietary fat for prevention of cardiovascular disease.Cochrane Database Syst Rev2000;(2):CD002137. .Meta-analytic tools for medical decision making: a practical guide.Med Decis Making1995; 15:81–96. 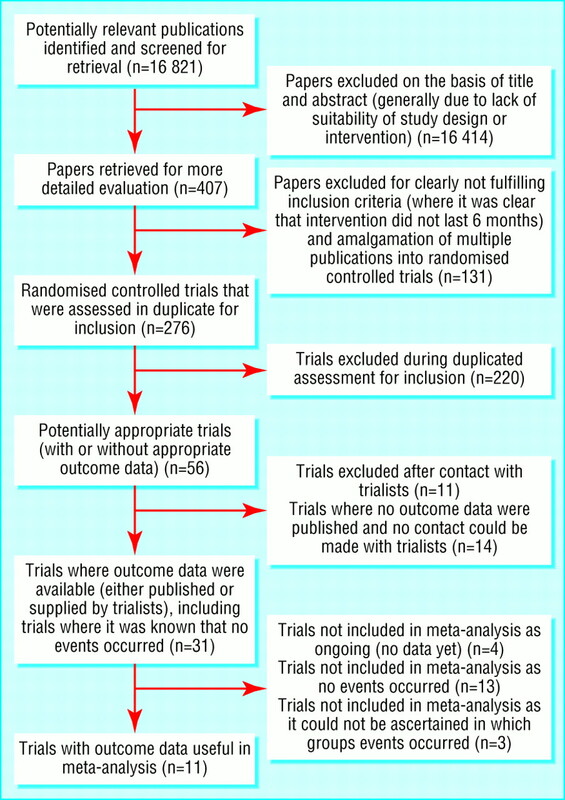 .Meta-analysis in clinical trials.Control Clin Trials1986; 7:177–188. .Ciplot: confidence interval plots using S-PLUS. Manual version 2.London:Institute of Child Health,1999. .Meta-analysis regression.Stats Tech Bull1998; 42:16–22. .A random-effects regression model for meta-analysis.Stat Med1995; 14:395–411. .Bias in meta-analysis detected by a simple, graphical test.BMJ1997; 315:629–634. .Long-term effects of participation in a randomized trial of a low-fat, high-carbohydrate diet.Cancer Epidemiol Biomarkers Prev1996; 5:217–222. .Effects of changes in fat, fish, and fibre intakes on death and myocardial reinfarction: diet and reinfarction trial (DART).Lancet1989; 2:757–761. .The effect of diet on bile acid kinetics and biliary lipid secretion in gallstone patients treated with ursodeoxycholic acid.Am J Clin Nutr1986; 43:239–250. .Langzeiteffekte einer Ernahrung mit fettreduzierten Lebensmitteln auf die Energieaufnahme und das Korpergewicht [Long term effects of nutrition with fat-reduced foods on energy consumption and body weight].Z Ernahrungswiss1996; 35:369–377. .Hypercholesterolaemia in treated hypertensives: a controlled trial of intensive dietary advice.J Hypertens Suppl1989; 7:S254–S255. .Weight loss with high and low carbohydrate 1200 kcal diets in free living women.Eur J Clin Nutr1997; 51:243–248. .Prospective, randomized, controlled comparison of the effects of low-fat and low-fat plus high-fiber diets on serum lipid concentrations.Am J Clin Nutr1992; 56:887–894. .Long-term effects of three fat-modified diets in hypercholesterolemic subjects.Atherosclerosis1994; 105:9–23. .Long-term effects of linoleic-acid-enriched diet on albuminuria and lipid levels in type 1 (insulin-dependent) diabetic patients with elevated urinary albumin excretion.Diabetologia1992; 35:165–172. .Corn oil in treatment of ischaemic heart disease.BMJ1965; 1:1531–1533. .Low-fat diet in myocardial infarction: a controlled trial.Lancet1965; 2:501–504. .A randomized trial of a low-fat dietary intervention in women at high risk for breast cancer.Nutr Cancer1997; 27:136–142. .Effect of a low-fat high-carbohydrate diet on symptoms of cyclical mastopathy.Lancet1988; 2:128–132. .Test of effect of lipid lowering by diet on cardiovascular risk. The Minnesota coronary survey.Arteriosclerosis1989; 9:129–135. 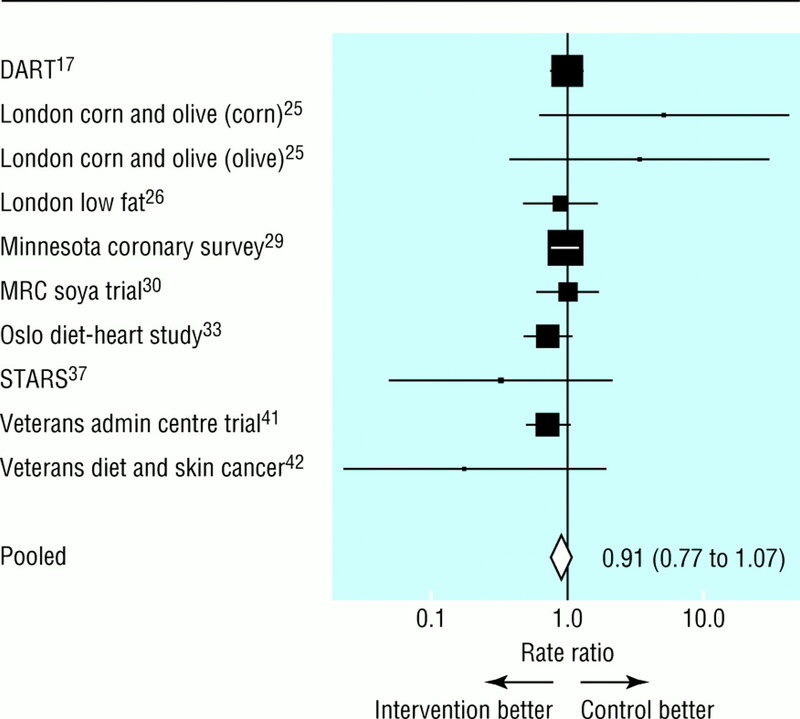 .Controlled trial of soya-bean oil in myocardial infarction.Lancet1968; 2:693–699. .A long-term study on the effect of spontaneous consumption of reduced fat products as part of a normal diet on indicators of health.Int J Food Sci Nutr1997; 48:19–29. .The effect of plasma cholesterol lowering diet in male survivors of myocardial infarction. A controlled clinical trial.Acta Med Scand Suppl1966; 466:1–92. .Prospective comparison of modified fat-high-carbohydrate with standard low-carbohydrate dietary advice in the treatment of diabetes: one year follow-up study.Br J Nutr1978; 39:357–362. .Favourable long-term effects from advice on diet and exercise given to healthy men with raised cardiovascular risks.Nutr Metab Cardiovasc Dis1997; 7:293–300. .Effects of low-fat diet, calorie restriction, and running on lipoprotein subfraction concentrations in moderately overweight men.Metabolism1994; 43:655–663. .Effects on coronary artery disease of lipid-lowering diet, or diet plus cholestyramine, in the St Thomas' atherosclerosis regression study (STARS).Lancet1992; 339:563–569. .Low fat, low cholesterol diet in secondary prevention of coronary heart disease.Adv Exp Med Biol1978; 109:317–330. .A randomized trial of a low fat high fibre diet in the recurrence of colorectal polyps. Toronto polyp prevention group.J Clin Epidemiol1994; 47:525–536. .Long-term effects on lipid metabolism of weight reduction on lactovegetarian and mixed diet.Int J Obes1990; 14:113–125. .A controlled clinical trial of a diet high in unsaturated fat in preventing complications of atherosclerosis.Circulation1969; XL:II-1-63. .Effect of a low-fat diet on the incidence of actinic keratosis.N Engl J Med1994; 330:1272–1275. .Practical statistics for medical research. 1st ed. London:Chapman and Hall,1991. Randomised trial of cholesterol lowering in 4444 patients with coronary heart disease: the Scandinavian simvastatin survival study (4S).Lancet1994; 344:1383–1389. .Cholesterol lowering and mortality: the importance of considering initial level of risk.BMJ1993; 306:1367–1373. .Cholesterol and coronary artery disease: screening and treatment.Qual Health Care1998; 7:232–239. .Systematic review of randomised controlled trials of multiple risk factor interventions for preventing coronary heart disease.BMJ1997; 314:1666–1674. .Mediterranean alpha-linolenic acid-rich diet in secondary prevention of coronary heart disease.Lancet1994; 343:1454–1459. .Dietary prevention of coronary heart disease in women: the Finnish mental hospital study.Int J Epidemiol1983; 12:17–25.